Strengthening of the armed forces and population at large was undertaken by both the Nationalist and Communist prior to and during the Sino Japanese war in order to prepare the nation to face the foreign threat, but also to control the faith of the country during the bitter civil war. In 1924 the Whampoa Military Academy was established with Russian assistance where many communist cadres shared the lessons with their Nationalists counter parts including: tactics, strategy, intelligence, geography, war history, troop mobilization, weaponry, fortifications, political thought, Sun Yat Sen’s Three principles of the people, foreign languages etc. 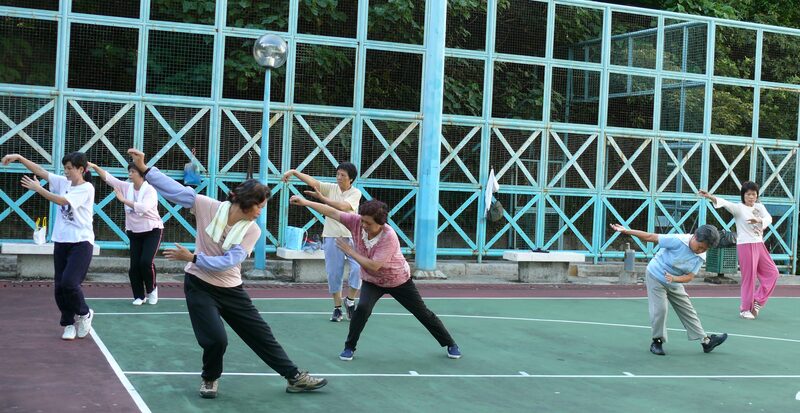 As for physical training it included gymnastics, fencing and field sports. Russian involvement stopped when they were expelled by Chiang Kai Scheck in 1926. Regarding close quarter combat training many of the original instructors had studied in Japan and were exposed to Jukenjutsu, Kenjutsu, judo etc. Pictures attributed to the Academy while in southern China show cadets in Japanese style protective gear practicing bayonet and saber fighting. In 1928 the Military Academy published a translation of a Jukenjutsu manual titled “Pi Ci Jiao Fan Cao An” (Chop and Stab Teaching Model Draft). By the time the Academy was moved to Nanjing armed and unarmed combat training was based on Xingyi Quan/XYQ (Rovere & Chow, 2008). The Chinese did implement some of the Japanese experience in their own practice; the protective gear used during partner training is all based on Japanese models. However, the Chinese developed their own combat methods using native skills as shown in period publications like Huang Bo Nian’s (黄柏年) 形意拳械教範 /Xing yi quan xie jiao fan (Xingyi Quan and Weapons Instruction Example) published in 1928; the techniques illustrated in the manual differ from the ones in Japanese publications of the period. Huang was hired by Zhang Zhijiang to teach Ba Gua, Xingyi Quan and Ci Qiang (bayonet fighting) at the Central National Arts Academy (Zhongyang Guoshu Guan) in 1931 as well as to be an assistant director; in 1937 Huang was invited to teach martial arts to the Central Military Academy at Nanjing (Qu, Huang, & Shu, 1996). Combat training was already ongoing by other instructors experienced in XYQ prior to Huang’s arrival, the use of native fighting skills was very much in line with the Nationalist goals of the time. The training methods taught to some of the Nationalist forces might have been transferred to the communist given that some of these men switched sides throughout the conflict. Once the Guomindang (GMD) started the purge of Communists in 1927, any further training opportunities from government sources was stopped and the communist had to make do with whatever had being obtained by those who received military training at Whampoa or elsewhere. Fighting between the two sides continue until 1934 when the Communists, to escape annihilation from their bases in the provinces of Jiangxi and Fujian started a tactical relocation in the famous Long March to finally set up a permanent base in northern Shaanxi by the end of 1935. During the march the communist had to cross the Dadu River, in the Battle of Luding Bridge a team of twenty volunteers armed with swords (Da Dao), hand grenades and with machine gun fire coverage they crossed the river using the chains used to support the planks that the nationalist had removed; once on the other side the communist replace these planks to allow the army to cross the river (Morton & Lewis, 2005). This event has been immortalized in communist folklore but later research seems to point out to a less romanticized version on how these events took place. Despite some exaggerations communist forces did train in the use of the Da Dao, similarly Muslim units that deserted the Nationalists were quiet adept in the use of the Big Knife. The communist had already started to work with Muslim communities in the areas of the Northwest years prior 1936 opposing the Ma clique, a risky proposition for those involved. As soon as Russian aid stopped the Nationalist turn their attention to Germany for material and training lasting from 1928 to 1938. Once the Sino Japanese war broke out in 1937 German advisers continued their duties, by 1938 all shipments for German munitions and other war material were stopped including recalling all German advisers from Chinese soil. As German personnel was leaving Russian advisers returned to China with a different mission, unlike the initial mandate back in 1924 of supporting the Chinese revolution this time to help China’s war of resistance against Japanese expansionism. The reason was simple; to ensure Japanese forces were less likely to start a Russo Japanese War. Prior to the official supply of help, Russian aviators and material was provided clandestinely. By 1941 relations once again cooled and aid dropped significantly forcing the Chinese government to seek other partners, this time the United States. Two years earlier the USA had approved some loans for the Nationalist but it was from 1941 to 1944 that the bulk of this help was delivered, at times with painstaking difficulties. The GMD forces in Burma, India and Yunnan received combat training from American instructors including hand to hand combat. Overall 57% of the aid received came from the United States, 37% from Russia and the remaining from other countries; unfortunately this aid was only enough to keep China in the war and not to end it and little of the assistance if any was shared with the Communists (Peattie, Drea, & Van de Ven, 2011). In the established Soviet areas in Jiangxi, Hunan, Shanxi, Gansu and others training included running, grenade tossing, obstacle crossing, shooting along with field sports like soccer, volleyball and basketball. Wrestling was also practice and martial arts were included in the form of individual or choreograph group demonstrations (Henning, 2003). The communist lack of war material forced them to device guerrilla tactics when fighting the Nationalist and these experiences were later used with great success against the Japanese. One key reason the Communist were more successful was the support they draw from the civilian population when compared with Nationalist guerrillas. Peasants would learn to despise the Nationalist forces presence due to their forced seizing of supplies among other abuses, in fact it was a common saying to “better join the Communist rather than wait to be conscripted in the army”. By applying hit and run tactics the communist were able to preserve their force and once the Japanese tried to engage them in large operations the former would just “melt away”. Overtime The Japanese grew frustrated and out of this frustration the Three All Policy was born (Kill All, Burnt All, Loot All), which only served to strengthen Chinese will to resist (Peattie, Drea, & Van de Ven, 2011). Communist tactics were so successful than after the Xian Incident of 1936, when Chiang Kai Sheck was forced to end the conflict with the communists in order to present a united front against the Japanese, the GMD invited communist officers to serve as trainers in guerrilla tactics by 1937. As the Japanese tried to expand control on Chinese territories they used puppet troops and among other plans the construction of fortified outposts manned by as little as thirty and up to couple hundred men, these fortifications were located away from the main controlled areas which allowed guerrillas to pick the outposts apart one by one. Communist’s offensives included bayonet charges, small arms attacks, the use of automatic rifles, hand grenades and swarming of enemy positions to engage in hand to hand combat. The communists also recruited criminal gangs and secret societies like the Red Spears in their operations (Peattie, Drea, & Van de Ven, 2011). It is safe to say combat training was provided despite severe limitations and gained through hard experiences by the communist forces in the Northwest, a similar case but with added difficulties was lived by the forces in the Northeast. After the fall of Manchuria and the start of the Sino Japanese war in 1937, the army and police forces in the area were unable to immediately conduct guerrilla warfare given that the Japanese advance moving from south to north caught the Chinese unable to withdraw to rear areas to regroup, and were effectively trapped against the border with Russia (Peattie, Drea, & Van de Ven, 2011). Following the example of general Ma Zhanzhan armed struggle began in 1931 violating orders not to resist. Volunteer armies including Big Knife and Red Spear Societies quickly started to gather and by 1933 these forces had to retreat to safety or face annihilation. Communist attitude towards these groups was at first hostile going as far as calling for their members to kill their commanders and join the communist call. Soon the communist realized that their class struggle message was irrelevant for the War of Resistance against Japan and took steps to correct it. Several mopping campaigns conducted by the Japanese to destroy Chinese guerrillas were taken in the subsequent years, but only in 1941 the Japanese were finally able to destroy most of them or forced them to surrender and the remaining survivors fled to neighboring Russia (Coogan, 1993). Chinese forces in Northwest China training bayonet fighting in 1939. Note the lower quality protective gear used. Snow board is great, snow board is great! They catch the devils [Japanese] unable to run! By 1941 they continued the tradition by organizing skiing activities during winter time, usually lasting 2 weeks. The team would be led to train and perform in a forest 100 km out of town, sometimes they had performances to show off their skills. Swimming was also important. China’s Northeast has many rivers some of them are not wide but have deep and fast currents. At the time there were few bridges and there were not many boats at hand to cross them. Some locals would cut down big trees and put them in between banks and they call this structures “Du Mu Qiao”(single wood/tree bridge). During that period of time, our armies needed to cross rivers when they traveled; therefore it was required that soldiers could swim. For example in the summer of 1938, a team from the 6th army was active around the Hei Long Jiang, Tang Yuan County when they passed Wu Tong River there were some soldiers who did not know how to swim which caused problems. During the war, rivers could be our advantage to block and divert from the enemy but also became a trouble for those did not know how to swim. To solve this problem the army promoted swimming classes for soldiers. First, we had to practice swimming movements on dry land, and then we could go into the water. Instructors would hold our bodies teaching us how to float; once we were used to the water then can advance from there. I only learnt breast stroke and back float. I remembered after I just learnt how to swim I had to cross a small river and once I arrived to the other side I had already lost all my strength and I had to float back with a log. In order to improve our swimming skills, we often took boat rides during rainy days, or practice on jumping off the boats or from high ground. Once we learnt how to swim we put on our gear and practiced more Wu Zhuang Qiu Du/ swimming across water with full gear (Zhuang, 1983). After the end of WWII the civil conflict reignited with the communist declaring victory in 1949. The influence of Russian combat methods continued into the 1960s, when additional manuals were translated or republished with some modifications; shortly after the PLA started to move further away from Russian influence by creating their own methods of training. Communist forces were at a disadvantage when facing Nationalist and Japanese armies, as the war with Japan continue alliances were created temporarily. Communist guerrillas were the best strategy in order to preserve their strength and by using hit and run tactics they were able to frustrate the enemy. In order to increase their numbers the communist did everything they could to gain peasant and secret societies support in their fight against the Japanese and GMD. Combat training was a mix of different skills were close quarter fighting was needed in order to negate enemy fire power. Northwest armies made use of China’s massive terrain to their advantage while their Northwest counterparts were cornered and had to flee to neighboring Russia to escape destruction. It is in the Russia border that Chinese forces were exposed to Russian combat material which served as the basis for the first close quarter combat manual published by the communist in 1946. Coogan, A. (1993). The Volunteer Armies of Northeast China. History Today . Henning, S. (2003). The Martial Arts in Chinese Physical Culture. In T. Green, & J. Svinth, Martial Arts in the Modern World. Wesport: Praeger. Morton, W. S., & Lewis, C. M. (2005). China Its History and Culture. Mc Graw Hill. Peattie, M., Drea, E., & Van de Ven, H. (2011). The Battle for China. Stanford: Stanford University Press. Qu, W., Huang, S., & Shu, S. (1996). Zhongyang Guoshuguan Shi. Rovere, D., & Chow, H. H. (2008). The Xingyi Quan of the Chinese Army. Berkeley: Blue Snake Books. Snow, E. (1968). Red Star Over China. New York: Grove Press. Zhuang, F. (1983). Recollection of Sports. Journal of sports literature and history , at The Journal of Sport History and Culture .